← How old are old Halifax oaks? Just under a year ago a Press Release from NSP (Nova Scotia Power) indicated NSP planned to increase the proportion of electricity derived from biomass to 7% of the total, up from 2.8% in 2015, while reducing use of fossil fuels. Most of this would come from clearcutting living trees, including whole tree clearcuts, rather than from forestry and sawmill wastes. 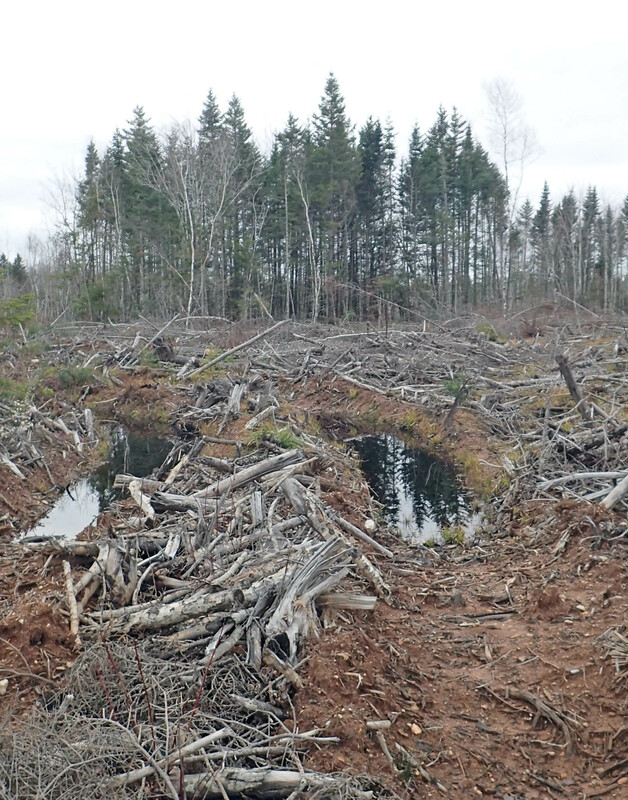 Public concern about clearcutting forests for bioenergy was reflected in a petition launched in February of 2016 to Stop destroying Nova Scotia’s forests for biomass power generation . It quickly garnered over 20,000 signatures and mobilized the formation of the Healthy Forest Coalition (HFC). Two major concerns were expressed in the petition and by HFC related to clearcutting forests to produce electricity: first, about the clearcutting itself which is highly destructive of Nova Scotia Acadian forest biodiversity and ecosystem services; and second, it was contended that burning forest biomass for bioenergy is not carbon neutral but actually increases the output of CO2, even compared to coal. The science on forest bioenergy GHG emissions, although often denied, has only grown stronger. A Bioenergy GHG (Greenhouse Gas) calculator developed by scientists with Natural Resources Canada allows users to estimate the “time to parity” and net GHG emissions or uptake for forest bioenergy schemes, giving values for Best- and Worst-Case Scenarios. The “time to parity” is the number of years after initiating a forest bioenergy project that GHG emissions would be higher than if a specified fossil had been used. The GHG emissions are expressed as “CO2 equivalents” and include emissions of GHG gases such as nitrous oxide as well as CO2; for forest biomass, most of the emissions are associated with CO2. A peer reviewed, open-access scientific paper (2016) provides the rationale and data for the Bioenergy GHG calculator. “Yrs”: the number years after initiating a forest bioenergy project that GHG (mostly CO2) emissions would be higher than if a fossil fuel had been used. kgCO2GJ-1 is the total CO2 euqivalents emitted over the first 50 years per gigajoule of energy generated. The top numbers refer to the best-case scenario, the bottom numbers to the worst-case scenario. Depending on its source, even use of wood for home heating can increase GHG emissions. 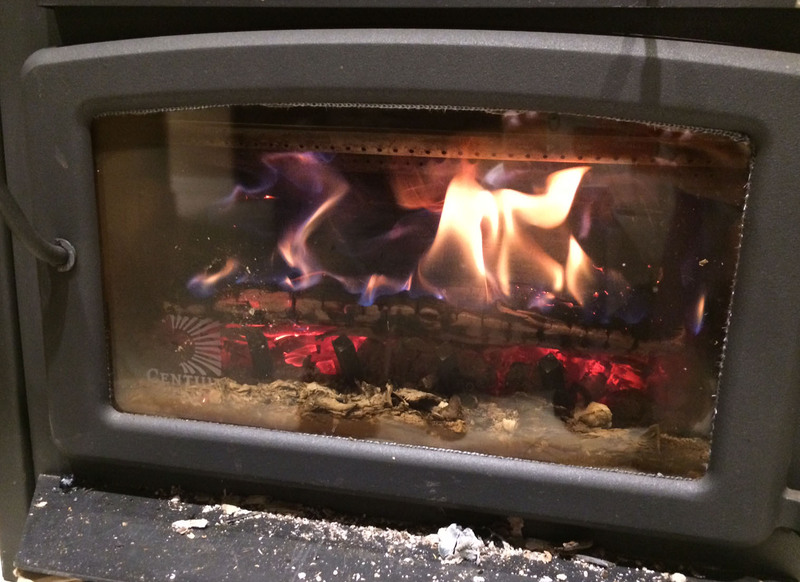 As a fuel, wood has a pollutant emissions profile similar to coal. These conclusions are not really news. The common assumption that forest bioenergy schemes involving harvest of living trees are carbon neutral was seriously challenged in 2009 when a group of U.S. Scientists published a paper in the prestigious journal Science titled Fixing a Critical Climate Accounting Error. There has been a plethora of evidence produced both before and since that paper challenging the carbon-neutral assumption. There’s simply been a lot of denial going on. Industrial forestry interests, with active support of governments, continue to promote forest bioenergy and insist that it is carbon neutral, or that the appropriate time frame to look at GHG emissions is 100 years (not 30 or 50 as advised by climate scientists) and/or purposely obscure the distinction between use of forest and sawmill wastes to generate energy (many but not all of which reduce GHG emissions compared to coal), and forest bioenergy schemes which involve harvesting of living trees, most or all of which do not reduce GHG emissions compared to coal. On top of the issues with GHG emissions, clearcutting is especially destructive in Nova Scotia, as it is conducted on very short rotations (40 – 50 years or less) in an area of naturally mixed, multi-aged, Acadian forest; our forests are already suffering from nutrient depletion associated with acid rain/low inherent buffering capacity and past clearcuts; and the clearcutting has been pervasive, resulting in losses of biodiversity and ecosystem services in both aquatic and terrestrial systems. Loss of productivity following clearcutting would make the carbon emissions compared to coal even greater than estimated by the feds’ calculator. See Forest Biomass Energy Policy in the Maritime Provinces: Accounting for Science for more details. Will 2017 be the year we begin to face up to these realities? I would like to think that the scientific staff in the Nova Scotia departments of Natural Resources, Environment and Energy are on top of this issue and regularly inform government ministers and MLAs about the issues and are working with policy staff to develop options for addressing them. However, based on discussions with government ministers, MLAs and bureaucrats over the last year, I have to conclude that is not happening. I suppose we might take comfort in knowing that Nova Scotia is no more regressive than most other jurisdictions in which forest bioenergy is being promoted by industrial forestry interests with politically driven government support including the rest of Canada, the USA, and Europe. We might, however learn from the Harper government’s denial of environmental issues associated with tar sand oil a few years back, and how difficult it is to shed a label of “dirty energy” once gained. The battle over forest bioenergy is moving very quickly in the same direction (see links below). Partnership for Policy Integrity. Also view on their website Status of amendments that would force EPA to treat bioenergy as carbon neutral, and the urgent need for legislative opposition: “The Collins bioenergy amendment in the Senate Energy Bill… was introduced by Senators Collins and King of Maine, and was attached by a voice vote to the Energy Bill recently passed in the Senate…The amendment’s wording is slightly vague, but nonetheless but its intent is clear: to impose upon EPA the requirement to treat bioenergy emissions as carbon neutral.” While the Energy Bill with the amendment was passed, this provision has apparently not yet been passed into law, and there is still an active campaign against that happening. Mirjam Roder et al. 2015. Biomass and Bioenergy 79: 50-53. This study addresses use of pellets produced from forest and sawmill residues (not clearcut trees) as substitutes for coal for electricity generation in Europe; most of the pellets are imported from NA including Nova Scotia. It has been assumed that this supply chain and conversion technology reduces GHG compared to coal. “The calculations showed in the best case results in GHG reductions of 83% compared to coal-fired electricity generation. 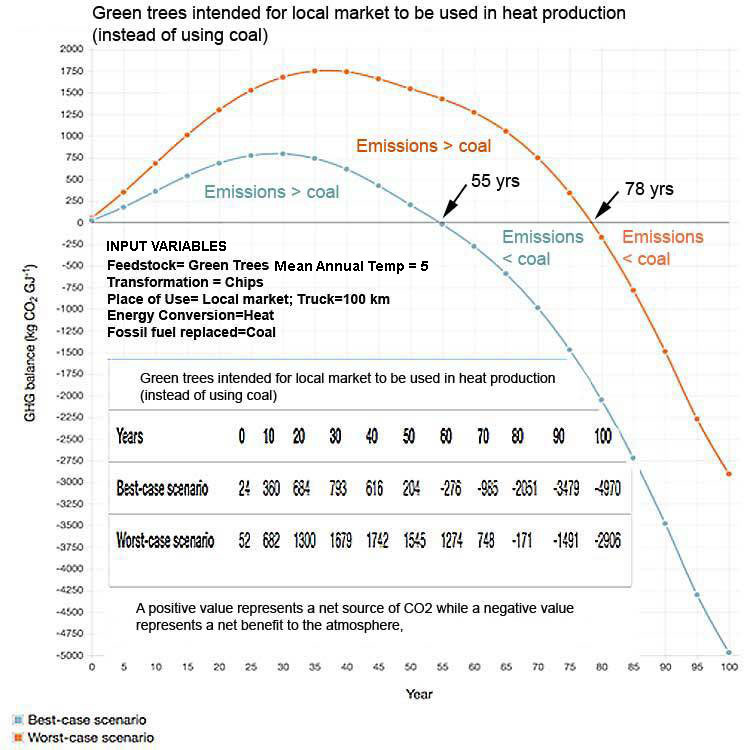 When parameters such as different drying fuels, storage emission, dry matter losses and feedstock market changes were included the bioenergy emission profiles showed strong variation with up to 73% higher GHG emissions compared to coal.” This is an example of how, as the planet heats up, the analyses of just what’s contributing to emissions become more and more detailed and critical. Are clearcut trees from Nova Scotia going into this supply chain? If they are, we can bet that at some point, that supply chain will be cut off. Why Is Europe’s Green Energy Plan a Failure? This entry was posted in Biomass, clearcuts, Climate Change, NSDNR, Show Us the Science. Bookmark the permalink.